3. Click on "Affiliate Contests"
4. Click on the green button that says "+ New Contest"
On this page you will be able to choose the Offer, Product, Contest Name, Description, set the Start & End Dates, Max Winners and Max number of affiliates to display on the leaderboard. On this page you can also choose to allow affiliate teams (which are currently limited to 2 members for each team). To enable teams, just click the switch on. Once you enable teams, you will be able to 'manage' the teams (see image below). You must create the teams yourself by adding the affiliates to the teams. 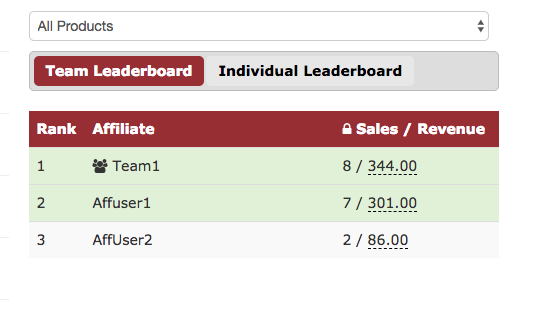 The 'Individual Leaderboard' will always be displayed for contests. The individual leaderboard does not display teams (if any). You can see the individual results by clicking on the TAB that says "Individual Leaderboard." You are not required to offer any prizes for the individual leaderboard winners -- it is there for display and informational purposes only. NOTE: Once a team is setup, you can not change or edit the team. You can also make your contest PUBLIC, which will then make it appear on the Affiliate Contests page and in the Affiliate Offers section. To make it public, select ON using the toggle switch that says "Public" next to it. Then click the blue button that says "Create" and your contest will be live!